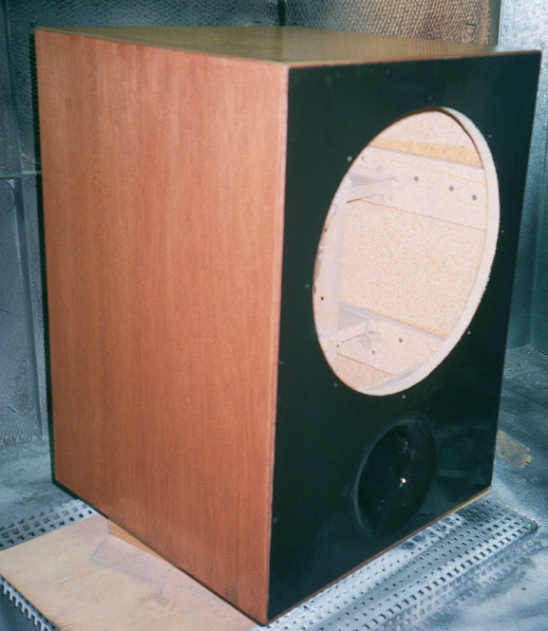 Before I design or build any speaker, I like to decide on my design goals. These would be certain criteria the speaker has to meet when it's completed. Do I want the lowest 3 dB down point as possible in a size-no-object enclosure? Or can I sacrifice some space and get away with a higher f3? 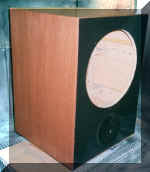 Maybe an enclosure that isn't tuned to give a completely flat anechoic response but will yield a flat in room response. Are looks important? Can the box be twice as deep as it is tall? 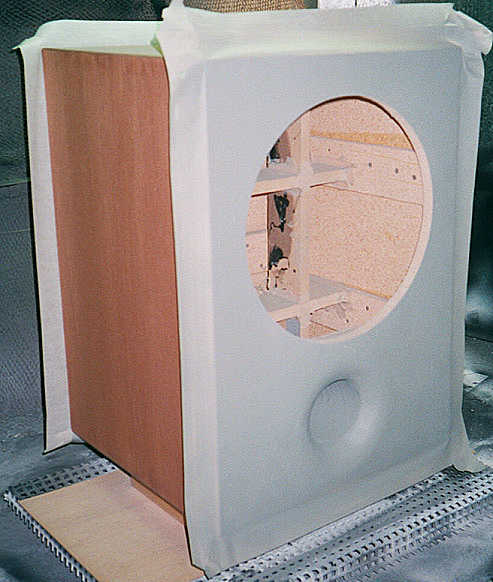 What type of finish will the speaker have? Will it downfire? What's the smallest diameter port can I get away with before port noise becomes a problem? Should I go PR instead? How much money am I willing to throw into this speaker? And the questions go on and on but you get the idea. This helps me easily decide on what type of speaker I'll end up with and how it will sound. 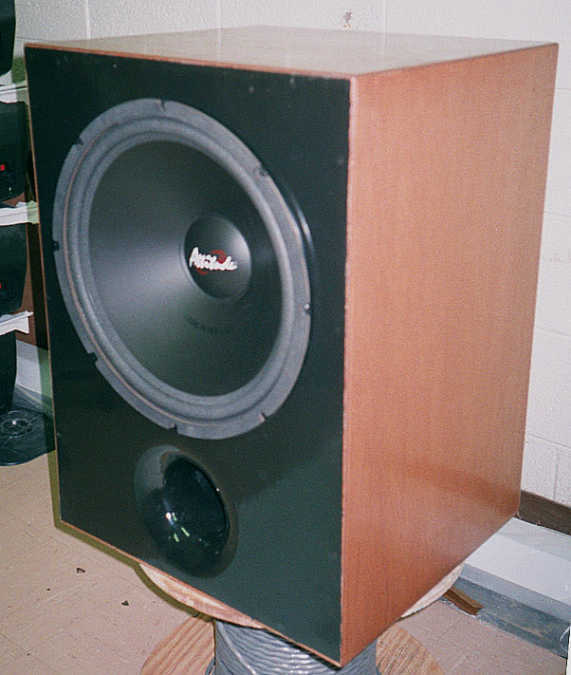 For many people who are building their first sub, they'll simply state, "I want it to go as low and as loud as possible!" Well I've been there and done that, so my design goals usually vary a bit more. I am probably more critical about certain factors than I need to be. But to me it presents more of a challenge and a greater satisfaction when the final product comes to life after weeks of making it all come together. So I present you with the UA3504 15" Subwoofer. The specs above are manufactured specs. I did do my own T/S tests and got very similar results. I just can't remember where I'd written them down. The box was designed using the actual T/S parameters. So the first thing I did was plug and chug some numbers to see what kind of box this driver would really like to be in. Using various programs from Brian's ported.xls to Bass Box Pro 2.0 to Juha Hartikainen's WinISD. I found that the driver would work best in a rather large ported enclosure of 4.75 cubic feet tuned to 30 Hz with an f3 of 32 Hz. That big of a box was not going to pass especially to achieve an f3 of only 32 Hz! With that you can easily see that low f3 is not this speakers strong point. This is due to a high Qms and Vas which results in a more efficient driver. Which is a definite plus for low power amplifiers. I wanted a small box at the expense of having a relatively high F3 but with the bonus being greater efficiency. This sub sounds awesome with only a few watts in. So I took the box down to what was an aesthetically pleasing size for a 15" woofer. 18"W x 17"D x 25"H. Minus all the bracing (which was a lot) and the woofer and port, I ended up with a net internal volume of only 2.75 cubic feet. I thought at first that it would be to small for this woofer, but that was as big as I dared go to still achieve my design goal of a "small enclosure". So I went ahead and plugged in 2.75 ft^3 and ended up with an enclosure with an f3 of 39 Hz being tuned to 35 at the expense of a 3 dB hump in frequency response. The hump I surely did not want, so by dropping fB to 30 Hz, the hump is reduced to 0.5 dB, which is much more suitable, especially since the box is so small. 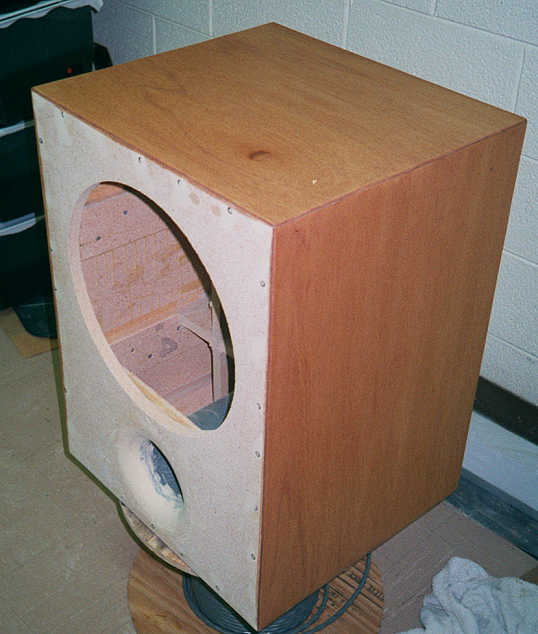 I wanted the box to hit hard in the mid-bass region and this design will certainly do that very well. You'll notice from the graphs that this speaker will also work perfectly (with a Q of 0.70) in a sealed enclosure of the same volume. So if you like the sound of sealed boxes better than ported, all you need to do is put a PVC end cap on the other end of the port and your set. Either way this sub sounds great with DVD movies and most all kinds of music. The box was constructed of 3/4" particle board. Oh no, I said the 'pb' word. You're right I didn't use MDF on this box. I went back to the old school methods and used good old fashioned particle board. For all you MDF fans (me being one of them) you can get away with using particle board as long as you understand a few things: particle board is not as dense as MDF. 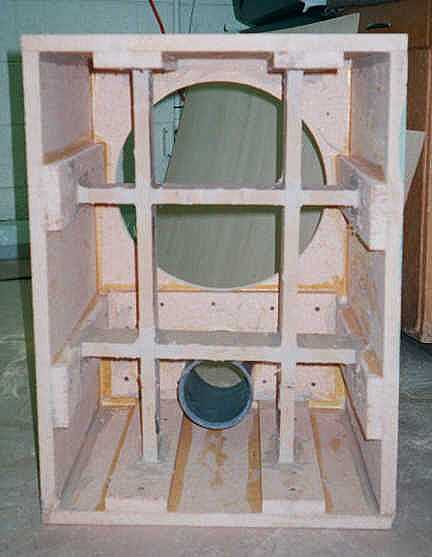 Therefore bracing technique and panel width must be doubled to reduce panel vibration. Also particle board is much more difficult to work with than MDF. Screws tend to split the wood easier. Bits and pieces can break off corners easily and be difficult to repair. So taking those factors into consideration, I tried to make the box as thick as I could and use a lot of solid bracing. I was extra careful in building the box so as to not split or break off any corners. I had planned to cover the box in 1/8" mahogany which would further strengthen the panels and provide better protection on the corners. 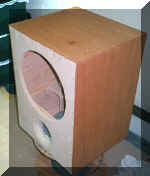 I can safely say that I "got away" with building this sub box out of particle board. The panels remain motionless during even heavy passages of pounding bass. By looking at the pictures to the right, you can see how I have two vertical and two horizontal braces that are interlocked to each other in the middle. Each brace runs to another brace which runs parallel to the panel it supports providing 1.5" of thickness over that particular area. Now the reason I don't have all the panels 1.5" thick was too maximize the internal volume of this enclosure. Extra internal bracing would have reduced internal volume. I had to compromise just a little between maximum internal volume and maximum internal bracing. I believe I achieved the best of both worlds by using the technique that I did. After the box was built and all the bracing in tact, I went ahead and cut out the 4 sheets of 1/8" plywood veneer. The reason for using 1/8" plywood mahogany in my case, was because I had just enough left over from a previous project to finish up this one as well. Which is also why I used the particle board. I already had a bunch of it on hand. Sometimes that is the deciding factor when building a box - the stuff you've already got. Okay so I don't like to waste wood. Anyways, I like to cut my veneer 1/8" too big. This way I can sand down the edges to ride exactly flush up against the other piece of veneer. It gives a seamless look. I used Liquid Nails and a caulk gun and ran a thick 1/4" bead up and down the entire side panel. I wanted the glue touching every part of both pieces to make a strong bond between veneer and box. These side panels will never come off in a million years. After finishing the mahogany panels, I sanded down everything real smooth - first with 120 and then 220 sandpaper. I went ahead and stained the sides and the top with its first coat of stain. Then a second, third and fourth until it reached the color I liked best. After the last coat of stain dried, I lightly sanded all the sides with a synthetic steal wool of 800 grit. Now it was time to paint the front and back baffles. This is done by using painters-type 2" masking tape to protect the newly stained sides. I then sprayed three coats of gray primer on the front and back, while sanding with 400 between coats and after the final coat. I then brushed on the black lacquer with a fine-bristled, quality paint brush. After one coat, I sanded with 220 and did another coat. After the second and final coat, I sanded the front and back down again with 220. Now I could peel off the paint and apply the final two coats of a high gloss polyurethane to the entire enclosure. This ensures an even shine throughout the whole enclosure including the black front and the stained top, bottom and sides. The final look is remarkable. The speaker enclosure looks absolutely wonderful. The box feels incredibly smooth and just shines like a light bulb. 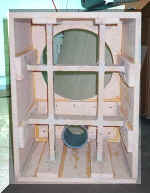 To the right are thumbnails of the the different stages of the building process of this subwoofer. Each one shows how production progressed until the final product was complete. This speaker I have to say is the most gorgeous of any the others I've built recently. I really love the way it looks. Not to mention the way it sounds. I'd have to say it has a very robust type of sound to it. It's very heavy and strong. It doesn't take a whole lot of power to get this sub to start shaking everything in the house. But when it gets going, it doesn't want to stop. I really like the unique bass response of this sub - it's tight, it's fast and it's clean. Most importantly this sub passes SAF by a landslide. My wife loves this speaker, not only because its small but because it looks so nice. This sub is also for sale at an incredible price. I'm practically giving it away. So check out the For Sale page and see if this sub might not suit your needs. Then give me a call and we can work out the best way to get this sub into your own sound system. Just a little bit of info regarding how the frequency response was measured. The sub was measured in my front yard so as to avoid all reflections from walls and ceilings. This is about the best anechoic response you can get. Only the ground is capable of interfering with the results. I used a precision frequency generator, frequency counter, amplifier, and my trusty Radio Shack analog SPL meter. 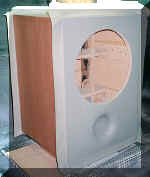 The sub was placed in the grass as far way from the house and any walls as possible, while the SPL meter was placed at exactly 1 meter from the front baffle at the same height as the dust cap. I ran 9.75 volts into the driver which has a nominal impedance of 4 ohms which roughly equates to 23 watts. Since impedance varies with frequency, we can't say exactly how many watts the driver was dissipating, but we can get an idea of how hard the sub is being pushed. 23 watts is very conservative. I then plotted the SPL at 5 Hz increments starting at 15 Hz working my way up to 100 Hz. I then accounted for meter correction and plotted the results in Excel. That is the graph you see to the right. The response has a small hump of about 2 dB from 50-80. Below 50 Hz the response begins to drop off where it's 3 dB down point would be figured around 40 Hz. The response continues to roll off gradually just as it should dropping to about 93 dB at 15 Hz. In-room response of the sub would improve the low end response making it sound flatter than it measured here. 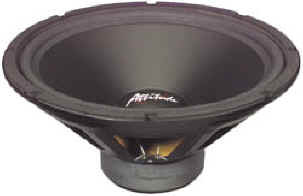 For a 15" subwoofer in an enclosure this size, it hits plenty deep and plays plenty loud.